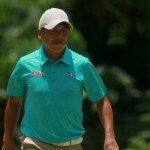 Jay Bayron, whose late rally proved short at Binitin last week, put on a strong start this time, hitting four birdies at the front for a 66 and catching Keanu Jahns and Gerald Rosales in the lead at the start of the ICTSI Negros Occidental Classic at the Negros Occidental Golf and Country Club here yesterday. South Korean Lee Jeong-Hwa sets out for a big return on the ICTSI Champion Tour she once dominated as she rejoins the title hunt in the $75,000 event, which gets going Wednesday at Tagaytay Midlands here. 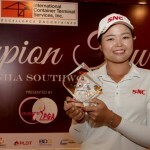 Princess Superal has taken her botched comeback bid at Manila Southwoods in stride and will instead use the setback as motivation when she sets out for the ICTSI Champion Tour at Tagaytay Midlands beginning Wednesday (July 25). The ICTSI Champion Tour kicks off its two-week swing here at Manila Southwoods with the crack international field, led by the fancied Thais and Taiwanese, putting premium on shot selection as they slug it out for top honours in wet condition in the $75,000 event starting today (Wednesday, July 18) here.